The extent of the funding pledged to the Palestinian Authority by donor countries reflects the extent of their support for Israel and its policies. The American taxpayers’ contribution to the Ramallah government’s bank account is dwarfed by the large sums the U.S. government donates to Israel every year. It’s impossible to get excited over the American pledge of $900 million (two-thirds of it for strengthening Salam Fayyad’s government and the rest for Gaza’s recovery) and forget the $30 billion the United States has promised Israel in defense aid by the end of 2017, as last week’s Amnesty International report noted. The $900 million pledged to the Palestinians in Sharm el-Sheikh should be seen as part of the regular American aid to Israel. As an occupying power, Israel is obligated to assure the well-being of the population under its control. 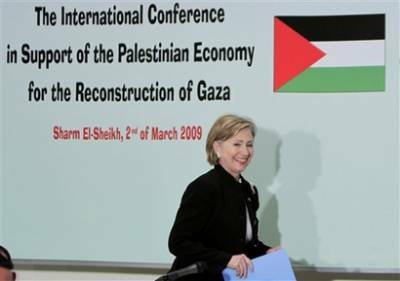 But Israel is harming it instead, after which the United States (like other countries) rushes to compensate for the damage.The Clinton and Bush administrations – and Barack Obama appears to be following in their footsteps – erased the phrase “Israeli occupation” from their dictionaries and collaborated with Israel in ignoring its commitments as enshrined in international law. The billions of dollars that Israel receives from the United States for weapons and defense development – which played a significant role in the destruction in the Gaza Strip – are part of Israel’s successful propaganda, which presents the Rafah tunnels and Grad rockets as a strategic threat and part of the Islamic terror offensive against enlightened countries. The West has blown the Hamas movement out of proportion, exaggerating its military might to the point of mendacity; this allowed for an extended siege and three weeks of Israeli military intractability. In the Palestinian and larger Arab world, this embellishment helps Hamas depict itself as the real patriotic force. The hundreds of millions of euros that have been donated or pledged to help Gaza, as though it were beset by natural disasters, are overshadowing the trade ties between Europe and Israel. The Western countries concerned about humanitarian aid for the Palestinians also buy from Israel arms and defense knowledge developed under the laboratory conditions of the occupation, that serial creator of humanitarian crises. And the 1 billion petrodollars? First of all, they were generated from a natural resource that logic dictates should benefit the Arab peoples. Second, they were pledged at a conference that boycotted Gaza (neither Hamas nor business people or social activists from the Strip participated in the donors conference). This is how Saudi Arabia lends its hand to the American and Israeli veto of inter-Palestinian reconciliation. Every cent paid to the Palestinians – whether for the Ramallah government’s budget or medical treatment of children wounded by Israeli pilots or soldiers – lets Israel know that it can continue its efforts to force a capitulation deal on the Palestinian elite. Only by recognizing that surrender is the goal can one understand that 16 years after Oslo, no Palestinian state was established. When did Shimon Peres, Ariel Sharon and Tzipi Livni begin talking about two states? Only after their bulldozers and military bureaucrats crushed the realistic physical basis of a Palestinian state. And this basis is: June 4, 1967 land (including East Jerusalem), Gaza – an inseparable part of the state – and zero settlements (and that applies to Gilo and Ma’aleh Adumim). During the 1990s it was still possible to describe donations to the Palestinians as an expression of confidence and hope in Israel’s readiness to free itself of the occupation regime it had created. But not in 2009. Support for Israeli policy – this is the only way to understand the fact that other countries keep pouring in hundreds of millions of dollars meant to put out the fires set by this policy, without extinguishing the source of the blaze. A donor conference is underway in Sharm Alshaikh in Egypt is “to raise funding” for Gaza but is turning out to be similar to all previous conferences: lots of huff, puff and posturing. For the US administration, it is a way to prop the government of Mahmoud Abbas (whose term ended January 9). The US “pledged” $900 million but $200 million of those will go to cover deficits of the administration of Mahmous Abbas, $400 million to West Bank projects (many profiting Israel), and the remaining $300 million will be slated for Gaza but may never get there because the US refuses to deal or help anything associated with Hamas and Hamas is the de facto government (and most of the people) of Gaza. The European Union is trying to buy its way out of the nagging conscience of having supported a failing US/Israeli policy (a policy that tries to bypass democracy and find compliant leaders or pressure them into compliance). This money is also getting entangled in the “no discussion with Hamas” mantra (which only strengthens Hamas and their fundamentalist ideology). Hamas said it will not allow aid to achieve what the Israeli military failed to achieve by force (subjugation of the Palestinian people). Other money pledged is also ending up with so many strings attached that hardly any of it is likely to enter Gaza. But even if all these issues are solved, Israel simply continues to blockade Gaza and prevent reconstruction supplies from entering (a blockade that is not only an act of war but a crime against humanity). Ban Ki-moon, the UN secretary-general, said border crossings into Gaza must be reopened to allow aid into the devastated territory. “The situation at the border crossings is intolerable. Aid workers do not have access. Essential commodities cannot get in,” But neither he nor anyone else at this conference has even hinted at any pressure to be brought on Israel to achieve this opening. Gaza remains a concentration camp with its residents who like all prisoners prefer the tough prisoner as their representatives. Meanwhile, Israel plans to build 73,000 more housing units in the occupied West Bank areas outside Jerusalem and thousands more inside occupied Jerusalem (in tandem with demolishing Palestinian homes and continuing the ethnic cleansing)*. The posturing, speeches, and “pledges” thus distracts from what is really needed to achieve peace: pressure on the occupiers/colonizers not on the occupied/colonized. Israel must be told by the outside world to a) not only freeze all settlement construction but actually reverse it by returning the lands to their owners and removing the settlers from all areas occupied in 1967, and b) Israel must pay for the damage it inflicted on Gaza and comply with International law on the damages of the apartheid wall it is building, c) Israel must allow Palestinians including all refugees the choice of return to their homes and lands or to be compensated if they chose not to return (and compensate them for their suffering), and d) Israel must allow the right of self determination for all the Palestinian people (a referendum on what we want would be a good beginning) and for full equality for all residents regardless of their religion. Initiatives are in the works along those lines.